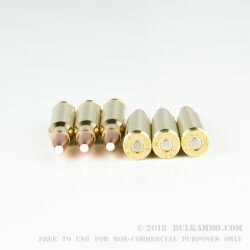 Load up your M-14, Remington 700, or other .308 Winchester rifle with these Silver State Armory cartridges for quick kills on deer and other game. 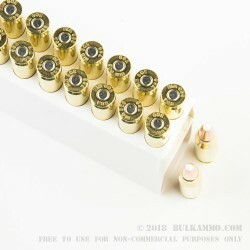 Each round in this box of 20 fires a light 150 grain AccuBond hollow point at 2,720 feet per second, delivering excellent long-range accuracy and devastating terminal effect. The AccuBond bullet is distinguished by its bonded-core design and heavy boat tail, which ensures reliable weight retention and expansion to bring down game efficiently. 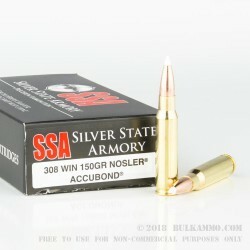 It was developed by Nosler, the parent company of Silver State Armory. This ammunition is loaded at SSA's headquarters in Packwood, Washington using non-corrosive Boxer primers and brass cases.